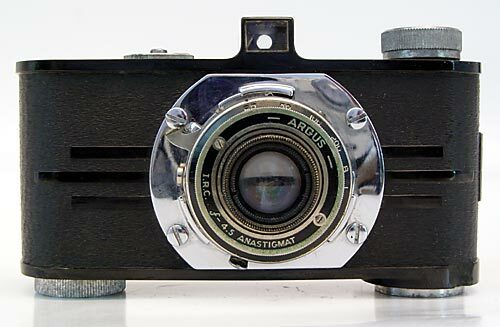 I won't insult your intelligence by telling you how important the original Argus A was to the adoption of 35mm film in the US. Yes, it was a 'plastic' copy of a Leica 1a but chances are you couldn't afford a Leica 1a then, and you certainly can't now. 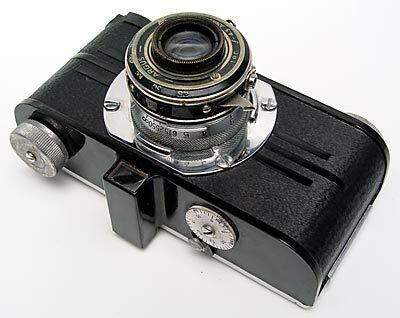 And that's the point; the Argus A was the first affordable, reasonable quality 35mm camera. Hundreds of thousands of Americans owned and used an A for decades and, despite its the historical significance, you can still pick up an Argus A for less than $20. No collection, be it just for display, or composed of 'users', is complete without at least one A. Here's my own example which I got for $14, shipped, from eBay. Condition is typical of what you should expect from a 70 year old camera that has probably been stored in a garage for the last several decades. Cosmetically, the aluminum knobs are slightly oxidized and there's a small chip out of the substantial, bakelite body. Functionally the shutter is not closing and the sprocket / frame counter mechanism seems to be frozen solid; both of these problems are not uncommon and should be easy to address. When I get the chance I do want to get this camera working again and run a roll through it to have that dawn-of-35mm experience but this is a handsome camera that looks good on the shelf working or not. Actually, my example is the less common AF (available only 1937-38) which incorporates a constant focusing mechanism rather than the standard two position focusing settings of the more common A. Other than that the A and the AF are the same camera. This 'rarity' probably adds another dollar or two to the cameras value but should contribute to the camera's sharpness when I get it working again. There's still quite a few old-school enthusiasts using the A-series cameras. Here's a very useable, collectable and historical camera that can still be found for the price of 2 or 3 rolls of film. For the price of a hipster's Lomo you could start an A-series collection and your cameras will attract comments where ever you try to use them in public. The f4.5 designation of the lens is probably optimistic. If you estimate exposures based around f6 wide open you will probably get more accurate exposures. There's no interlock between the shutter and the film advance and the shutter release lever is easy to trip so take care when handling this camera when it is loaded in order to avoid double exposures. There's nothing to stop you taking a picture with the lens collapsed but it will be terribly out of focus. This camera will reward an organized workflow not a rushed one. 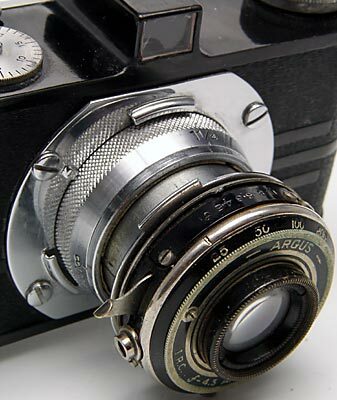 I have a wonderful little Pre-War Argus A2B f/4.5 in really good condition, and I was wandering if there was any value to it and where could I find out about it. I have the original box and the instruction manual. If you could please help me in this matter I would appreciate. These cameras were produced in such great numbers, and so many survive today that they do not have a high monetary value. Looking at eBay prices I'd value yours at between $30 and $60 depending on condition and an enthusiastic buyer. For more info stop by the Argus collectors group: http://arguscg.tripod.com/id54.html They also have a mail list and are very enthusiastic about actually using these old, basic cameras. That's where the fun is; trying to get a decent image out of an A.
I agree with you about the Argus A's place in American photographic history. I run a website about the Argus A (and AF and A2B and A2F etc.) at http://theargusa.com/ . I tried to gather as much information about the use, restoration, and repair of these cameras and put it into one free downloadable .pdf file. I wanted to make a one-stop source of info for anyone interested in the Argus A. Please feel free to swing by and check it out. I picked up an Argus A for about a dollar at an estate sale a few years ago. It's a fun little camera! Takes a little more thought and planning (and math) than most of us are used to, is all. And for long exposures (which I love to shoot), I like that it's got a "T" setting, which I'd never encountered before. 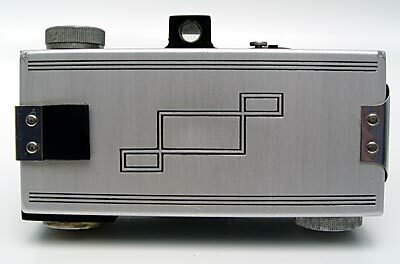 "T" is for "trigger"; click it once, and the shutter opens, and it stays open until you click it again.